Churches Close: When Is the Right Time to Close a Church? When Is the Right Time to Close a Church? HomeBlogThe BibleWhen Is the Right Time to Close a Church? In the book of Malachi, God laments about his people. Specifically he’s down on the priests because they show contempt for him. Their worship is so off-track that God wishes one of the priests would just shut the temple doors. This would at least keep them from lighting useless fires on his alter, from having useless worship. He’s so frustrated with them that he won’t accept their sacrifices anyway. So why bother? Just close the temple. This is a shocking thought, a seeming heretical idea. We hear of churches closing all the time. It’s usually due to one of two things. Often it’s for a lack of funds—because the people left aren’t giving enough to keep the church’s doors open. The other reason churches close is a lack of people—for too many have left. Generally these two items are tied to one another. Attendance drops, and then giving drops. Programs get cut, and attendance drops more. This continues in a downward spiral. Eventually there aren’t enough people left to do the work and not enough money to pay the bills. Shutting down is the only option. I’ve never heard of a church closing because they lost their way spiritually, because their worship has become offensive to God. Yet I wonder if this spiritual malady isn’t just as common—perhaps even more so. That their reason for gathering together each week is too off track from what God yearns for. I wonder if God grows sick of these misled congregations and wishes they would just close their doors. These spiritually impotent churches are just as dead—perhaps even more so—as the ones who no longer have enough people or money to continue. Some would argue that God’s words through his prophet Malachi apply only to the priests and to the temple of his day. This is an Old Testament thing. Projecting them on today’s church is taking the text out of context. Perhaps. But if we can’t learn from the Old Testament, why bother to read it? In an appropriate application, Malachi’s words to shut the doors of the temple are a warning that we should take seriously today. When our churches and their service become spiritually dead, God may want us to close our doors and not further profane his reputation. 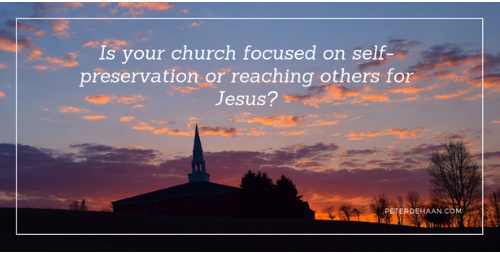 Before you assume I’m talking about someone else’s church, take a serious look at your own. Is it time to close church? It’s a sobering thought, isn’t it?